Every year around the holidays we get a group of friends together and we go out for an expensive meal at a nice steak restaurant in Chicago. I’ve said it before and I’ll say it again, I don’t see any reason why I should be paying $50+ for a steak when I can just go to Costco and get something that tastes just as good for $15-20… Besides the food, the point of this outing every year is to celebrate the holidays with our friends as well as Nick’s birthday; so it’s not like I wasn’t going to go. 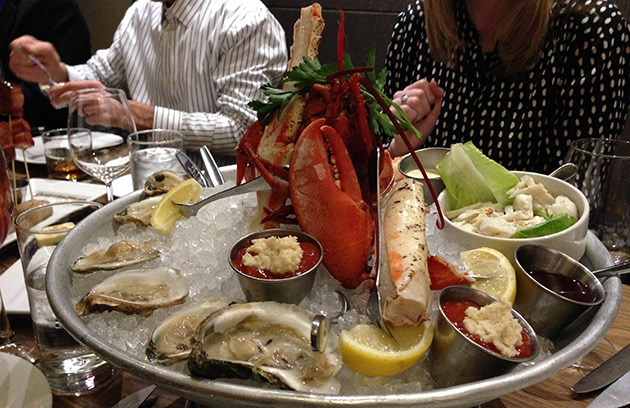 This year’s choice, which is always chosen by Nick, was David Burke’s Primehouse. We’d already done Mastros and Chicago Cut, so apparently this was the next stop on our “tour de steak”. As always the case, Celeste called in the reservation about a month in advance, so we had no problem getting a table for 10. What we weren’t expecting was to be bumped into the private dining room in the back of the restaurant. Apparently nobody had booked the room for that night so they freed up space in the normal dining room by giving it to us. It was actually perfect because this way we could hear everyone at the table and we didn’t have to yell over the other people in the restaurant. We started off with a few cocktails, which everyone seemed to enjoy, while we waited or the rest of our party to arrive. Once we were all seated Iman and Celeste had a little side meeting about appetizers, and before we knew it the entire table was filled with food. As is now an Iman tradition, 2 seafood towers appeared along side 2 orders of dumplings, bacon on a stick, scallops, and 1 order of tuna tartar. It was an insane amount of food for just appetizers, I’m surprised nobody ruined their appetite. It may come as a surprise, but I tried almost all of the appetizers… aside from the stuff in the seafood tower, because I’m already well aware that I don’t like seafood. 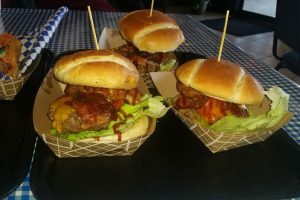 You can check out the pictures to see what was all included in the seafood towers, but since I didn’t try any of it, I can’t really tell you how it was, although everyone else seemed to enjoy it. In regards to all of the appetizers, my favorite was obviously the bacon on a stick. 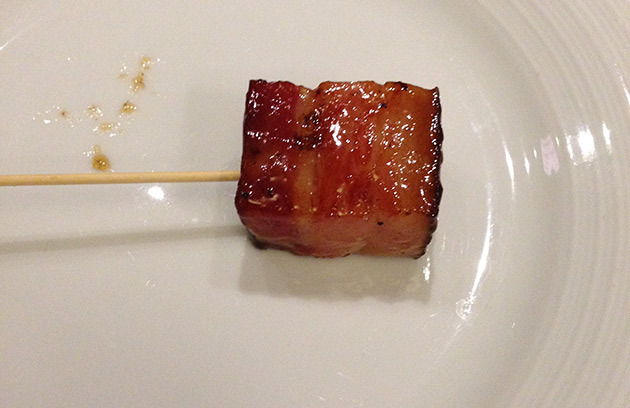 It was super thick bacon, on a stick… that’s it. Delicious. I tried one of the dumplings that was filled with shredded short rib, and it was good, but whatever the sauce was around the bottom of it was terrible. Way too spicy for me and kind of looked like puke. I think it was some sort of mustard based sauce, but I’m not sure. 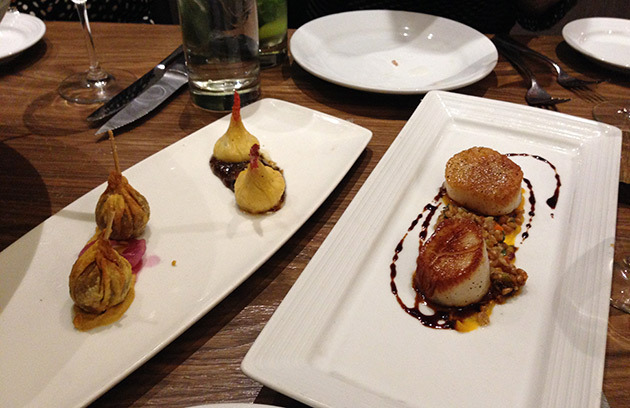 The scallops were ok, but I’m not a fan of the consistency of scallops so I don’t like to eat a lot of them. 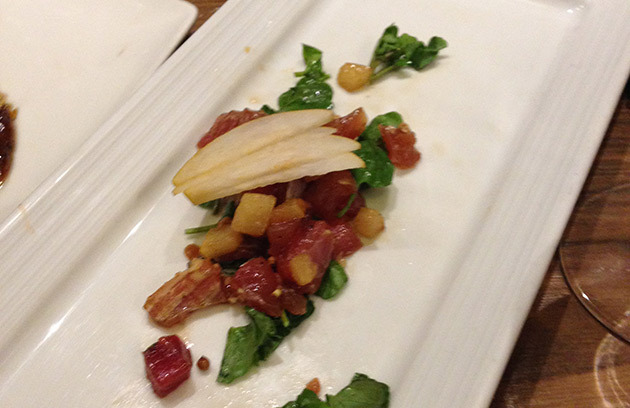 And finally that leaves the Tuna Tartare… definitely not my thing. I’m not a fan of sushi, so raw tuna obviously wouldn’t be at the top of my list. And out of all the appetizers, the tuna tartare had the most left on it’s plate towards the end of the course. After the appetizers we ordered a couple bottles of wine based on Jen’s recommendations, and put in our steak orders. Everyone ordered steaks, which I actually wasn’t expecting, and everyone except for Jillian, Pat and I ordered Ribeye’s; we ordered filets (Jillian and I had bone-in while Pat had normal). 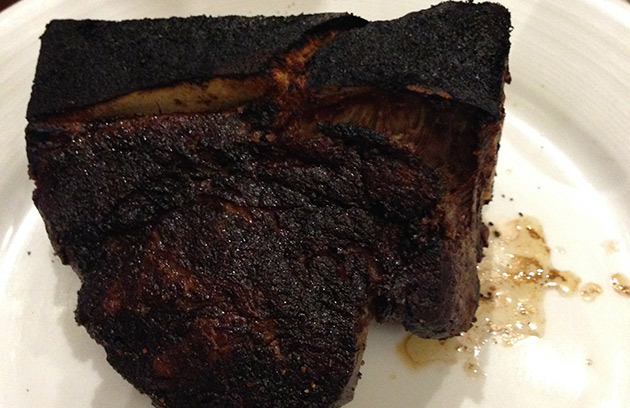 When the steaks came, I was a little surprised at how big the bone-in filet was. Usually when I get a filet it pales in size comparison to everyone else’s, but this one was pretty big even after cutting the bone off of it. 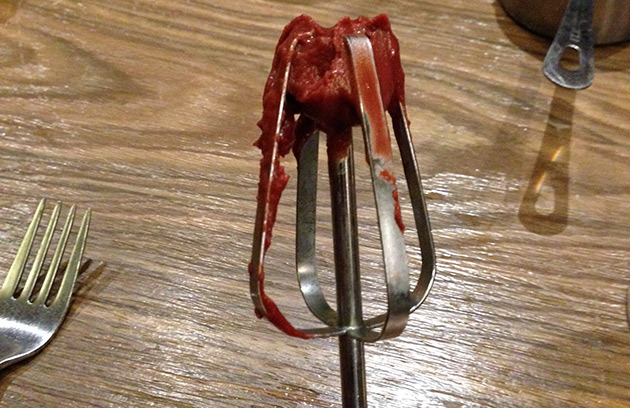 As for the taste of the steak… definitely not worth $50 to me. My stance on expensive steak is no secret, and I still haven’t found one that absolutely blows me away. I got it cooked medium, but it was medium-rare through most of it, and mine wasn’t the only one that wasn’t cooked right. Jill ordered medium-rare and her steak was definitely medium-well. It was so off that she actually sent it back! For a steak place of this caliber I was actually really surprised at how off a lot of our steaks were cooked. Most of them were at least close enough that didn’t warrant raising a stink, but Jill’s had no pink in it what so ever and it was supposed to be medium-rare; that’s just inexcusable. Our sides weren’t anything exciting, I think we got mashed potatoes, mushrooms and asparagus. The mashed potatoes were really good, but I didn’t even try the rest of them. Once we were done with our steaks, the dessert came out. If I didn’t think we could eat any more food after the appetizers, I’m not sure how we managed to eat dessert after devouring those steaks. They let you lick the batter from the cake beforehand! Celeste pre-ordered 2 of David Burke’s famous cake in a can for dessert, which is red velvet cake, cooked in a can, that you have to pre-order ahead of time. We went with 2 because the lady on the phone said that for a party of 10, 1 wouldn’t be enough. Well, with 2 of them, each of us got about a 1/4 of a cake, so 1 may have been enough. Either way though, this was the best cake I’ve ever had in my life, and I don’t eat a lot of sweets. 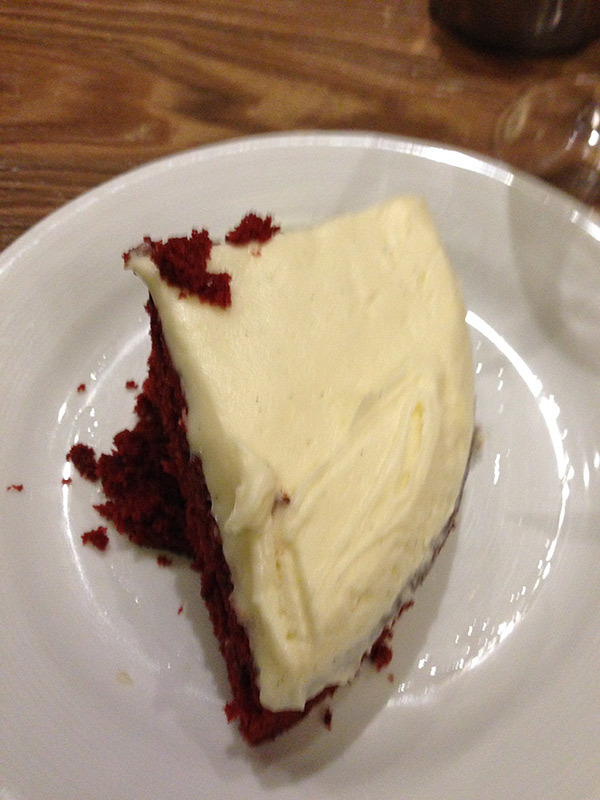 Come to think of it, the first time I had Portillo’s Chocolate Cake was on Christmas, and I thought that was really good, but it pale’s in comparison to this red velvet cake from David Burke’s. They even brought out 10 of the batter beaters covered in batter for us to lick before getting the cake, and even that was incredible. When all was said and done the dinner was a great success. 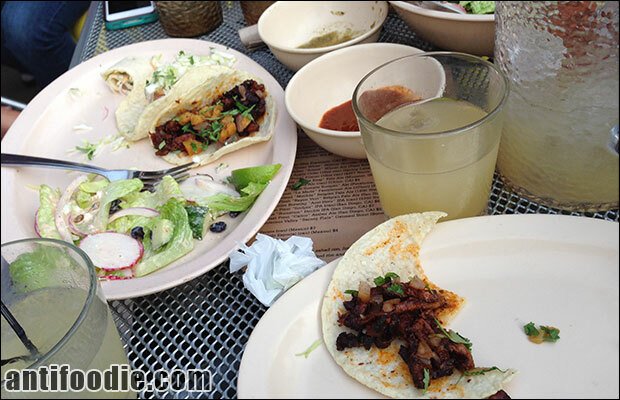 Despite how it may sound, the food was good, I just don’t think it was worth the insane amount of money we paid for it. However, that cake is worth whatever they charged us (I didn’t even look). The wine was a bit pricey and probably not worth it, and I’d probably just go with the normal filet next time and save myself $10, but I probably won’t ever go back to this place, so I don’t think I’ll have to worry about that. Sad review, as you sound like a cheapskate. Oh I’m definitely cheap when it comes to most things, but for this holiday dinner I usually don’t hold back, but I still expect a little more out of a restaurant when I’m paying $50+ for a steak. It’s not that it was bad, because it wasn’t, but over the last 6-7 years or so that we’ve been going to these fancier restaurants for a holiday dinner, David Burke’s is probably my least favorite when it came to the actual steak. Hell, we ate at Bob Chinn’s last week and I got a filet that was better than the steak I had at David Burke’s… maybe I’m just too picky, or as you said, a cheapskate… who knows, doesn’t change the fact that I left disappointed.